Carroll’s first step was to make a call to children’s author and illustrator Chris Judge. “It turns out Chris had family in Bray and was very interested. Together we organised two workshops for 50 children aged four to eight. Chris suggested that the giant be a girl and prompted the children to use their imaginations to come up with her story together,” she says. Judge went away for four weeks to flesh out the story and do all of the illustrations. David Forde, district administrator at Bray Municipal District, gave Carroll permission to use the land and property along the seafront for the project and said the local authority would match whatever funding was secured from businesses. One of the artists who revived the mosaics in Bray Dart station, Jay Roche, is also Judge’s brother-in-law. They worked together to convert the small illustrations into large murals, which were then covered in graffiti-proof varnish. “Chris and Jay’s budget was favourable, but we wouldn’t have been able to go ahead without the support of the municipal district. This made it easier for us to secure funding elsewhere as it made the project more tangible,” notes Carroll. “The art trail has solved the problem of antisocial areas and graffiti on the seafront. It has made the promenade much more family friendly,” says Forde. 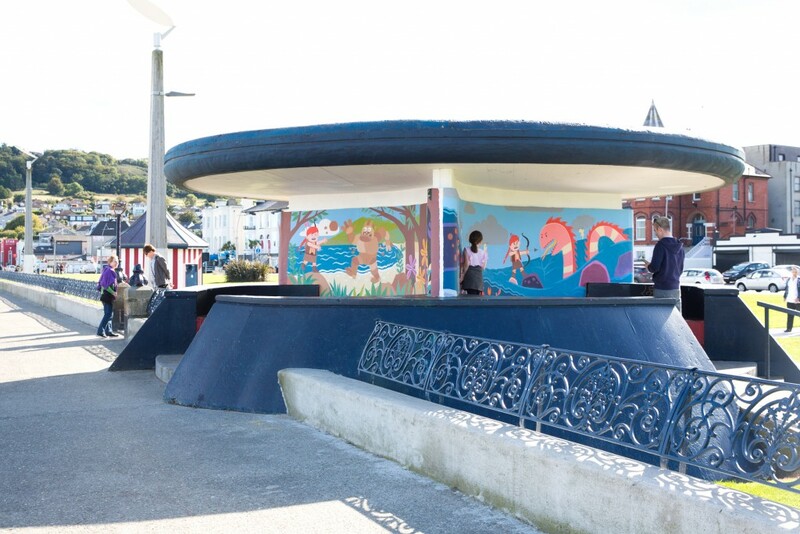 “If the budget is there, we are always open to progress art in public places.” Bray Municipal District has made the story available online as a free downloadable PDF and promotes the trail at every given opportunity. Platform Pizza was one of the local businesses to come on board with support, along with Bray Credit Union and Megazyme. Owner Conor Duggan’s children Abi, Erin and Hannah took part in the workshops and he has also incorporated Brave Maeve artwork into the restaurant’s children’s menus. The highly visual nature of the Brave Maeve trail allows children with limited or no English to understand the story. Carroll feels the project has potential to be a lot more than it is now to make it sustainable. “The community embraced Brave Maeve so quickly. I was overwhelmed by how into it people are,” she says. “I can see an opportunity to develop a wellness pack tied in with the story. The concept could also be replicated in other municipal districts, continuing the story of Maeve and Fionn [the male giant] and perhaps appealing more to teenagers,” she says. Brave Maeve Children’s Myth & Art Trail was also shortlisted in the Best Small Sponsorship and Jim McNaughton Perpetual Award for Best Commissioning Practice categories in the Allianz Business to Arts Awards, as well as being shortlisted for the Allianz Community Art Award.